I have just spent the last few days mining the V & A's (Victorian and Albert Museum) knitting section. (see link in "Mrs. Brown" post) It is AMAZING!! I took this quotation from some text describing a knitted pin cushion (in silk, no less). How many of us have knitted, silk pincushions today? "The Industrial Revolution in the 19th century transformed knitting, as it did many other handicrafts, into an automated process. Hand knitters found it increasingly more difficult to earn a living and knitting started to become a leisure pursuit." "The internet revolution of the 21st century has transformed knitting, as it has other handicrafts, into a free for the asking or posting handicraft. Knitting designers have found it increasingly more difficult to earn a living and hobbyists have begun to set the standard for what was once the domain of dedicated artists and designers"
Times change. The free markets rule. Half of the hand knitting industry has become the domain of part time designers who offer patterns for free on the internet, to garner a following and the other half of the industry, the production of yarn, drifts with the current in a market of ever diminishing quality. I am sure there will be a resolution of this shift, as there has been a resolution of every other change that has happened from the beginning of time. Art moves forward with man. Much is lost and much is transformed. It is difficult for me, though, to reconcile the tremedous effort and dedication given to the art of knitting by the designers that had put their heart and soul into their art, and as a result, hoped to earn a modest living by their dedication to the craft with.... Freeconomics. We don't have silk pincushions today. We don't need silk pincushions today. But we do need a standard. The same standard that gave us silk pincushions then, has given us fine lace knitting, glorious felting, and who knows what other wonders might have happened tomorrow. This is because the free market also says that designers must be paid for their art. Where there is no remuneration; there is no refinement, no progress, no accountability, no dedication; there is only a catch as catch can - here today, maybe, gone tomorow casualness to a craft that needs a strong, reliable committment to keep it from just slipping into obscurity as a lot of other hand work has. Support full time knitting designers. These are the people who will grow the industry because they have to. They will bring you new and innovative patterns, new techniques, new teaching methods. Their ideas often influence the production of new yarns and new products. 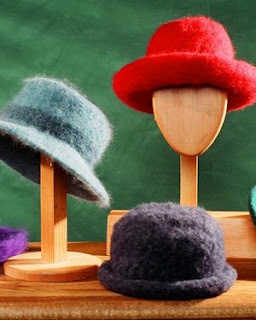 We owe the whole felting revolution to Fiber Trends, whose first pattern was the felted hat. Those who started knitting before 1995, I am sure, never felted. Felting was something that happened by accident in the laundry. Half the projects that create revenue for yarn retailers, today, I am sure, come from the technique of felting. I have used the past tense a lot here because I see designers slipping away, turning to other crafts or other means of paying the rent. There are fewer patterns forthcoming and not many new techniques. The winds of change are blowing...hang on to a sturdy post. It is a simplified Indian dish - Salmon in Bengali mustard sauce. It's a recipe from a new cookbook of hers. Does anyone buy books anymore? I'm off to look at IPads, apps....I'll keep you posted! !